My husband and I strolled our son down the wide sidewalk—my 37-week pregnant belly leading the way—headed toward the primates at the zoo. As the sun warmed our faces, the spider monkeys swung in their cage and peeped their heads between the bars. My son slithered out of the stroller and his golden-brown locks bounced in the sun. Pointing to the next large cage, he shouted, "Squirrels!" "Yes, those do look like squirrels!" I said. "But those are called squirrel monkeys." Those little monkeys seemed to have pep in their step, jovial little creatures. Kind of like toddlers. Our almost family of four walked a little closer when I looked up and noticed a large baboon in a nearby, separate cage. He sat on a large rock, his knees bent to his chest—alone. 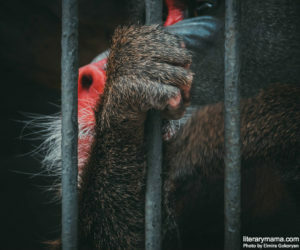 With no other primates in his cage, the baboon looked like an old man who was tired of living; depressed and ready for death. The baboon stared into the distance, never blinking. I wonder how he got here, I thought. I couldn't ignore the woeful captive. I heard the squeals from my son and other children around me but couldn't concentrate on what they were saying. Then the baboon noticed me gawking at him. Embarrassed, I looked away—but didn't want to. Not only did I feel sorrow for him, but sadness with him. They say primates are close to humans in regards to their need for socialization. They thrive in the presence of those who love them, and when I discovered the baboon, I understood why. His loneliness magnetized me. My feet rooted into the concrete. I wanted to stay there with him all day—never seeing another zoo animal. My husband and son marched up to me trying to hurry me along, but I pointed and said, "Doesn’t that baboon look sad?" "Wow. He does," my husband said, uninterested. He seemed more concerned with playing the role of Dad. "I hate it here," I whispered. We strolled on. Next were the felines. Two lions, two tigers, and a bobcat. Then we approached a cougar. She was light gray and large—intimidating. She paced around her small area like she was waiting for the phone to ring bearing bad news. I wanted to unlock her cage, to swaddle her like a baby and quiet her nerves. But knowing she'd likely pounce on me, I quickly put that idea out of my pregnant, hormonal head. Yet again, I felt pity towards the magnificent creature. Both the baboon and the cougar were stuck. No place to go. No one to love them. No one to love. Zoos are cruel, I thought. But my two-year-old son didn't need that life lesson that day. So, I tried to get the depressed animals out of my mind and make the day light for my toddler. The baboon didn't fade from memory. His pained, lonely face scorched me for months. Six weeks after our second baby was born, my mother was diagnosed with advanced cancer. Tormented by the thought of her death, I resigned from my college-prep teaching job to aid her. I became a stay-at-home-mother. I traded in my black stilettos for flats, a sleek messenger bag for a diaper bag, NPR for The Wheels on the Bus, and blow-dried hair for a messy bun. I chose motherhood. I chose my mother. More than a year went by, and my decision started to suffocate me. I sat on my beige couch, surrounded by my beige walls while my children napped—as I did every single day. The tedium of motherhood felt extra heavy that day. Some days, the monotony felt more bearable than others. But on that day, it stung. I threw a blanket over my criss-crossed legs and reached for my reheated coffee on the end table. I wrapped my cardigan around my chest and took a long sip. I tapped my phone to unlock it and went to social media—to enter other people's smiling worlds and escape my own monotony. Even over a year after the trip to the zoo, I still thought about that baboon. Staring at my phone, after a few scrolls, the dark image of the baboon haunted me. I am the baboon, I thought. Motherhood had confined me. Tears started to tiptoe up my throat to my eyelids. The summer sunlight beamed through the sliding doors. I brought my knees up, clutching them. I took another drink of my coffee to swallow my tears and keep them from tumbling. It didn't work. I cried. Subtle at first. I walked around the kitchen, wiping my tears with my fingers. But the tears kept coming. In our small bathroom, I looked in the mirror and began to moan. My cheeks became pink and wet. My lips pressed together and the corners of my mouth turned up. My forehead sparkled, but not in a beautiful way. A few gray hairs poked through the bun on top of my head. My new crow's feet sloped downward. This person who looked back at me was unhappy—really unhappy. Still in the bathroom, I slouched down, put my elbows on the sink counter and my hands hugged my face. My palms became damp with shame. But I couldn't look at that person in the mirror any more. I did not know her. I found my way back to the corner of my beige couch with my rainy eyes. That woman in the mirror, she had no goals—nothing that belonged to her and her alone. She had nothing that went beyond, "I will get my baby to sleep through the night" or "I will train my toddler to poop in the toilet." And daily, she envisioned the day when she would call her mother and she wouldn't be there to pick up the phone. I had to be more than a mother who sat on that beige couch, her only goal to get through the day. My children fulfilled me, but only half of me. Eating pretend pizza slices and painting rocks grew stale. The fact that they followed me through every room in our house allowed me to think that I must have been doing a decent job at loving them. I felt blessed, I did. But I needed more than this beautiful life with my beautiful children. Those beige walls not only trapped my body, but my brain. I needed to think and socialize, like the baboon. These primates live in "troops," where hundreds of baboons protect and love one another. They are intelligent and nurturing. The mothers quickly form bonds between their infants. Just like we do. But their intelligence cannot go ignored—they need to use it. Like that baboon I saw at the zoo, I was stuck. I didn't know where I was going. I was afraid. Afraid to work. Afraid to write. Afraid my mother’s cancer would come back. Afraid to go to grad school. Afraid to leave my children. Afraid to fail. Afraid to admit my truth to anyone else. So, I kept it inside, locking it deep within me, not even allowing my husband to feel my sorrow. Instead, I masqueraded a smile. And I hoped no one saw the pain growing from my own solitary confinement. Did I stare into nothingness like the baboon? I questioned. I worried. I prayed. But I did not act. I sat still. I mothered. And did nothing. For two years, I did nothing. But I wasn't the baboon. I could break from those beige walls, if I wanted to. And so one day I did—a color called Freshly Cut Stems. I grabbed the roller and painted my fears away. The beige walls no longer smothered me. Instead, the light gray-green color made our room feel airy—my heart lighter. My mother empowered me with the courage to paint those walls. She survived. If she could battle cancer—and win—I could escape the monotony of my beige walls. Finally, I could breathe again. My mother's courage to live gave me the courage to stop surviving motherhood, and instead, to revel in it. But I knew that to be a better mother, I needed to be more myself. Over a year has passed since I painted those walls, and today, I'm almost done with another graduate degree. I'm a freelance writer, and my fingers type stories daily on the keyboard of my laptop. No, I have not arrived at my destination--I don't even have one—but I am on my way. I stand as an energized mother and a stronger daughter. I still paint rocks with my children, swirling any colors I want. And it no longer feels stale. I'm no better than that baboon. It's just that I had a choice—and finally, I chose to be a mother, and more. Angela Anagnost-Repke is an extroverted freelance writer who also feels energized in the solitude of her home as her fingers click the keys of her laptop. She is a flawed mother who has been published in Good Morning America, ABC News, Scary Mommy, The Good Men Project, and many more. Angela has personal essays published in The HerStories Project. She is an advocate for a moms’ night out and is currently at-work on the cross-generational memoir, Mothers Lie. Your writing touches my heart! How is your mom????? Angela, I so enjoyed reading your article. Besides being a talented writer, allow me to say that you are a strong and courageous woman! I am quite proud of you and wish you success in everything you do! I look forward to more of your work. Thank you so much for reading! And Lucy, my mom is doing well. Praise god and her strength.